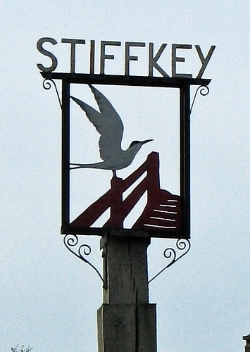 The River Stiffkey runs through the village, and used to power the Stiffkey watermill which was built before 1579. It was a small mill, running two pairs of stones, and it operated until 1881 when it was put up for auction as a warehouse. Little now remains of the mill: just a few low ruined walls showing the position of the building. Stiffkey is also famous for cockles Cerastoderma educe which still retain the old name of "Stewkey blues". These are stained blue by the mud in which they live.